Ambika Soni announced a fund for sustainability for community radios in India. Union Minister of Information and Broadcasting, Smt. 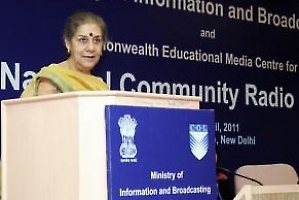 Ambika Soni said, the Ministry will consider setting up of “Community Radio Fund”. This would be based on the model followed in several countries where the setting up of such a fund has been a success. For this purpose, the issue would be taken up on high priority with the key agencies such as the Planning Commission and concerned ministries. The setting up of such a fund would ensure the sustainability and enhanced outreach of the Community Radio Movement within the country.